Bouge Blog: Time for a change. s with ties and cuff-links and whatnot, the watch you wear is a direct reflection of your personality and style. So when picking out your watch(es), be picky. There's a LOT of choices out there. You could go with a wind up or a battery, leather strap / fabric strap / metal band, choose from a host of sizes, colors, movements, dials & dial positions, metals, faces, etc. The list is endless. Wearing timepieces on the wrist began coming into popularity around the beginning of the 20th century, when pocket watches were on their way out. During this interim period of fashion, hoards of smaller pocket watches were converted to large wristwatches with makeshift lugs for straps. At this point in time, the technology and innovations were leading toward smaller watches that were more useful when kept at-the-ready. By today's standards, these watches are still quite large and relatively "thick" ranging from 1.0 to 1.4cm thick. They sure make a statement though. The faces of these watches are either metal or porcelain or enamel, and the styles of the fonts for the numbers can be outstanding. I've been reading about and eying vintage watches for about a year now, and finally jumped in to get the watch above - a c.1910 Regulateur style watch from Revue Thommen. This is a modern pocket watch conversion - the case for it was probably made last year. 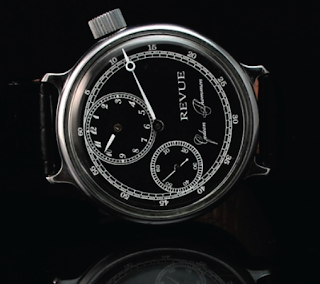 The "Regulateur" style was a relatively short-lived trend back in the day where the hour, minute, and second hand rotate around their own axis. 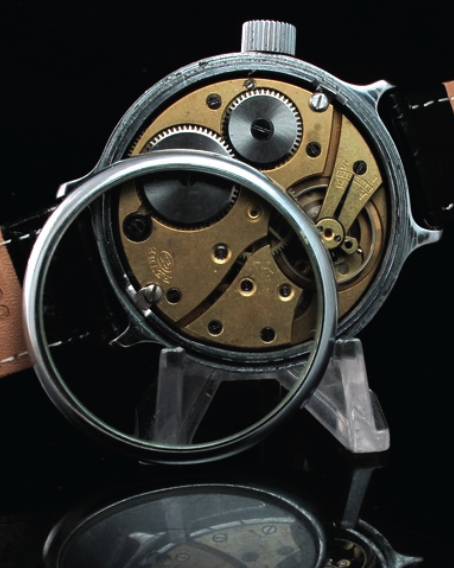 It's (very) different and sets it apart from watches that can be found today. The face is black enamel, in excellent condition, and has the brand name REVUE showing with the Gideon Thommen below in script. The wind knob is a bit bigger than most and is in a position that actually makes it easier to wind. 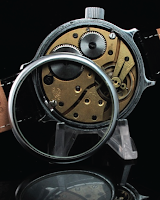 To finish it off, an "exhibition back" was installed so that when you take the watch off, you can see the inside of the watch working through a second crystal on the reverse. This watch supplements one that was passed down from my grandfather. Lucky for me, he had very good taste. 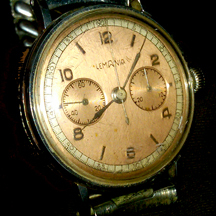 The maker is Lemania, c.1950, chronograph (stop-watch feature) with a copper face. It is much smaller than the Revue Thommen and has a metal and green shark-skin band. Sadly for me, this watch has had a rougher life and needs to go back in for repairs...again. Which brings me to the point that while these watches are all very cool, they do require costly maintenance from time to time. Springs break, they get slow or fast, and they do not take well to any sort of water at all. Take care of them - wind them gingerly and make sure they're protected on rainy, wet days. So shop around for your next watch and choose a style that fits you. A quality watch doesn't have to cost thousands, but it should definitely suit your personality.